A colorful medley that tastes as luscious as it looks. Sun-drenched tomatoes and sweet basil combine with creamy mild cheddar. Basil and tomato were born to go together and the result is wondrous, in recipes or alone. BUY 3 or MORE AND SAVE!!! Toast half a whole-wheat bagel, top with a tomato slice, then sprinkle with grated Cabot Cheddar and toasted almonds; broil or microwave until the cheese is melted. Or, top a toasted whole-wheat English muffin half with a slice of Cabot Tomato Basil Cheddar, sprinkle with shredded ham, then broil or microwave. My go-to Cabot cheese is the extra light cheddar -- the only "light" cheese I have found that MELTS. But the tomato-basil cheese is a rich, flavorful cheese with a great texture -- creamy but never oily. It was a hit as as an appetizer at a party, but I prefer it melted on toast. 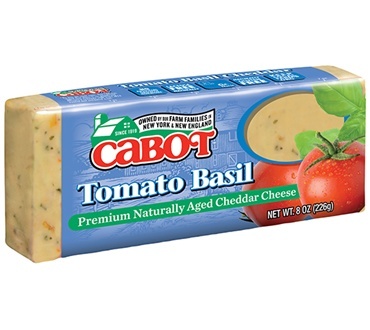 This is my favorite flavored Cabot cheese. I use in in salads, as a snack and is perfect on a burger. I cannot get enough of it. Not a big hit with guests. Only thing left on the snack tray. People just seem to ignore it after trying it. Myself included. Really good cheese for trays! We had this on a tray with crackers which had rave reviews! Also cut up for salads and balsamic dressing - YUM! I eat it almost daily & am always looking for new ways to include it in my meals or as a snack.Makes a great addition to omelets & as a topping for pasta casseroles.I wish it was additionally available in larger blocks & somewhat "reduced fat".